Note: The Joy of Cooking App for iPad, created through a partnership among three parties—the Rombauer-Becker Family, their publisher Scribner, and us here at Culinate—is available on the Apple App Store. Read more about the app on the Culinate apps page. Seventy-five years ago, a St. Louis widow named Irma Rombauer took her life savings and self-published a book called Joy of Cooking. Her daughter Marion tested recipes and made the illustrations, and they sold their mother-daughter project from Irma's apartment. 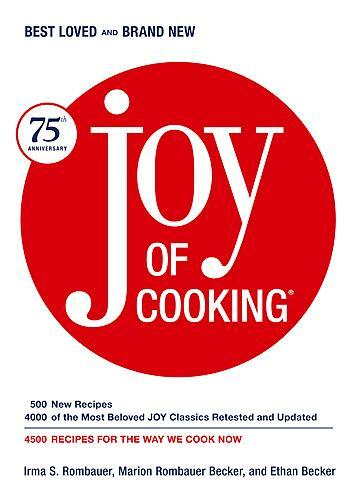 Today, nine revisions later, the Joy of Cooking — selected by the New York Public Library as one of the 150 most important and influential books of the 20th century — has taught millions of people to cook, helped feed and delight millions beyond that, answered countless kitchen and food questions, and averted many a cooking crisis. Ethan Becker, Marion's son, leads the latest generation of Joy into the 21st century with a 75th-anniversary edition that draws upon the best of the past while keeping its eye on the way we cook now. It features a rediscovery of the witty, clear voices of Marion Becker and Irma Rombauer, whose first instructions to the cook were "stand facing the stove." New illustrations focus on techniques, including everything from knife skills to splitting cake layers, setting a table, and making tamales. This edition also brings back the encyclopedic chapter "Know Your Ingredients." The "Cooking Methods" chapter shows cooks how to braise, steam, roast, sauté, and deep-fry effortlessly, while an all-new "Nutrition" chapter has the latest thinking on healthy eating as well as a large dose of common sense.